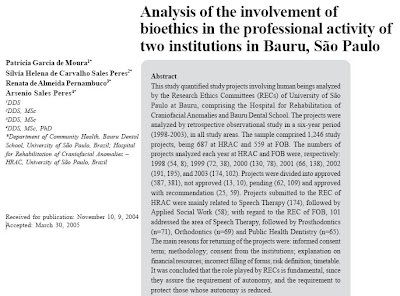 Abstract: This study quantified study projects involving human beings analyzed by the Research Ethics Committees (RECs) of University of São Paulo at Bauru, comprising the Hospital for Rehabilitation of craniofacial Anomalies and Bauru Dental School. The projects were analyzed by retrospective observational study in a six-year period (1998-2003), in all study areas. The sample comprised 1,246 study projects, being 687 at HRAC and 559 at FOB. The numbers of projects analyzed each year at HRAC and FOB were, respectively: 1998 (54, 8), 1999 (72, 38), 2000 (130, 78), 2001 (66, 138), 2002 (191, 195), and 2003 (174, 102). Projects were divided into approved (587, 381), not approved (13, 10), pending (62, 109) and approved with recommendation (25, 59). Projects submitted to the REC of HRAC were mainly related to Speech Therapy (174), followed by Applied Social Work (58); with regard to the REC of FOB, 101 addressed the area of Speech Therapy, followed by Prosthodontics (n=71), Orthodontics (n=69) and Public Health Dentistry (n=65). The main reasons for returning of the projects were: informed consent term; methodology; consent from the institutions; explanation on financial resources; incorrect filling of forms; risk definition; timetable. 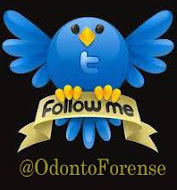 It was concluded that the role played by RECs is fundamental, since they assure the requirement of autonomy, and the requirement to protect those whose autonomy is reduced (Published in Brazilian Journal of Oral Sciences. April/June 2005 - Vol. 4 - Number 13).